The trusty ol’ USB drive is a firm favourite among our BackupAssist customers and for good reason. 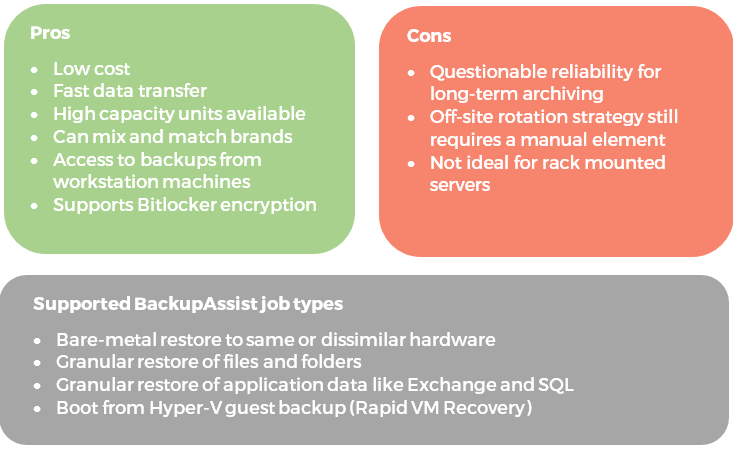 They’re fast (if you go for a USB 3.0 model), they support all of the job types BackupAssist has to offer and if you don’t mind a little manual intervention they’ll let you create a simple, reliable offsite backup strategy without it costing the earth. Another reason they’re popular is that if you need to access a backup, you can simply plug them into any Windows machine and there’s no specialist hardware needed to restore your data. I should note that I’ve found reliability can vary slightly. I like the Transcend Storejet, for example, because it has some degree of shock absorption so copes well with the abuse of being carried to and from the office. Last but not least, if you decide to go down the USB route, don’t forget to carry a spare! RDX is becoming an increasingly popular choice among the small to medium sized business customers I work with. 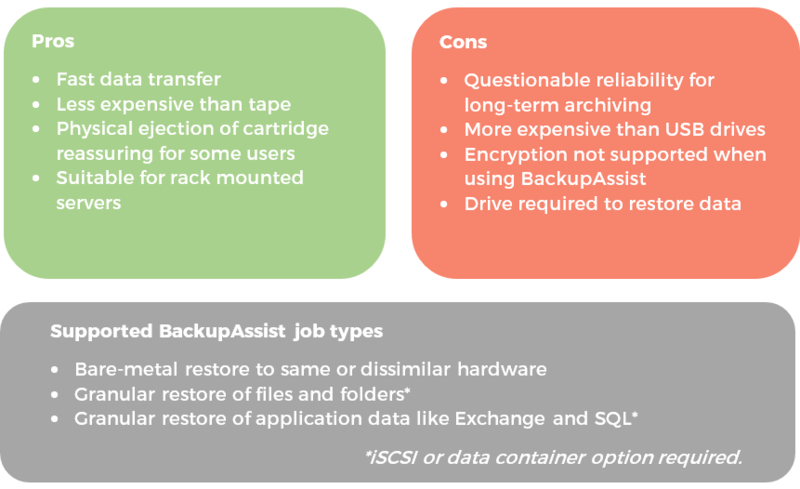 While it’s a little more costly initially than USB drives, it’s still cheaper than tape hardware and offers a good range of restore options for BackupAssist users. Like most USB drives, RDX is basically a SATA hard disk, but it’s in a cartridge. As strange as it may sound, I think a large part of the appeal for users is that they just find it more reassuring to see a cartridge eject, ready to be taken offsite than a USB drive that needs unplugging. Interestingly, though, Windows doesn’t see them in the same way as a USB drive, instead, they appear to the operating system as an emulated optical media, a bit like a DVD drive would. A consideration because of this, is that you’ll need to use the ‘data container’ option in BackupAssist if you wish to restore granular data or perform incremental backups (as opposed to backing up the whole thing each time). Tapes aren’t usually a media we recommend to BackupAssist users however, I’m aware there are some instances where they serve the purpose well. I’m also aware that drives aren’t cheap, so if you already have one, you may not be too thrilled about ditching it. 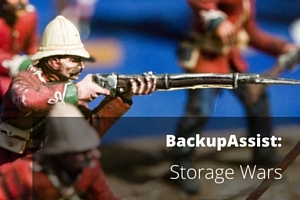 Tape backup is only suitable for files and folders using BackupAssist. If you’re using Hyper-V or you want to create a backup suitable for bare-metal restoration of a machine, you’ll need to look at an alternative. Also, if you’re wanting to restore lots of files in one go, you should be aware that the tape has to spool to the correct section to restore the data which can add an overhead, unlike with USB for example. If you’re wanting to create a long-term archive of backups where you’re storing vast amounts of data, the tapes themselves are relatively inexpensive and therefore ideal for your Grandfather-Father-Son rotation schemes. Another point to note is that because tape drives are a linear data device as opposed to a random access device. When backing up a large data set, the throughput can actually be very fast, making them ideal for archiving large amounts of data. When situated locally and accessed over fast network connections, they fully support bare metal backup and recovery. 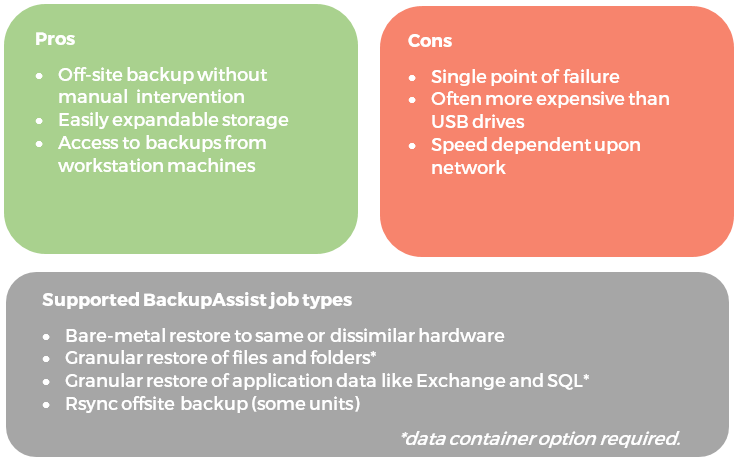 When using BackupAssist’s off-site add-on, you can also create an off-site backup (files and folders only – not server images) without needing to rotate any media. While I won’t explicitly recommend any one vendor, we do hear good things about Synology and QNAP devices in particular so they might be a good place to start. 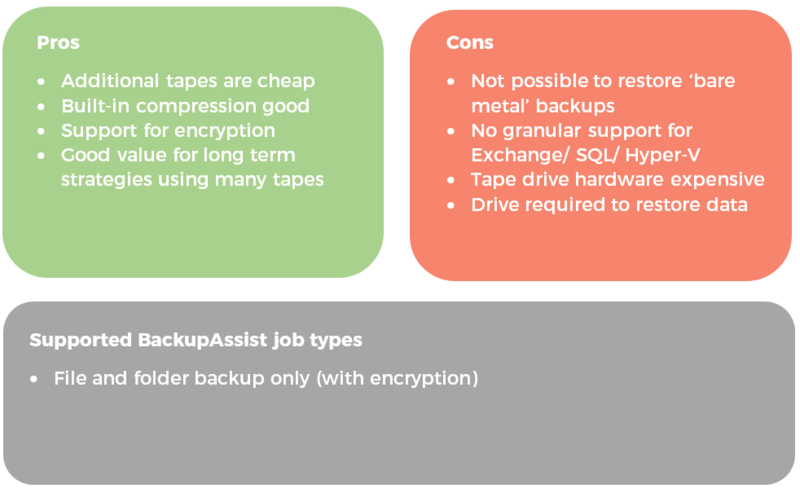 One last point to mention is that lots of our customers use multiple media types together for a ‘belt and braces’ approach – this is one of the benefits of BackupAssist. A popular combination is a local USB drive for disaster recovery purposes and an offsite NAS for important files and folders. Overall, though, which media you choose, generally boils down to your requirements, and of course your budget. I hope that’s been helpful as an introduction to the more common media types and please feel free to share any recommendations with me in the comments below.